Philip Harlow was appointed President and Chief Operating Officer of XTAR, LLC, on June 1, 2010. He is responsible for the growth and strategic direction of XTARs Government business, overseeing the management, marketing and technical aspects of the company. Previously, Mr. Harlow worked as Chief Technology Officer for CapRock Communications (since acquired by Harris Corp). In that role, Mr. Harlow was responsible for all aspects of engineering, IT, infrastructure development, new product management and strategic planning. Prior to CapRock, Mr. Harlow was Vice President of Engineering and Technology at DRS Technical Services, provider of satellite, terrestrial and enterprise-wide network communications services. He joined DRS in 2006 from Intelsat General where he served as Vice President of Engineering following the acquisition of PanAmSat. Before joining PanAmSat/G2, Mr. Harlow was instrumental in the PanAmSat acquisition and integration of Esatel Communications, where he served as Vice President for Business Development. Mr. Harlow also worked at Loral Orion as Director for Sales Engineering supporting the North America Sales Group. Mr. Harlow graduated from the Royal Military Academy, Sandhurst, United Kingdom, and holds an honors degree in Electronic Systems Engineering from the Royal Military College of Science. He also has a Masters degree in Systems Engineering from The George Washington University. What history and experience do you have with commercial sales of X-band, for example with CapRock, and how will that benefit the government users? I have been helping to develop solutions for Iraq and Afghanistan since the first troops entered the region in 2001. Even then, Afghanistan was an underserved region in terms of deployed Ku-band capacity, and it quickly became clear that the rate of take-up of commercial Ku-band would result in a shortage of capacity in the region. This was recognized by all the major satellite operators, including the fledgling partnership that became XTAR, and plans were laid to augment the capacity in the region. XTAR, of course, focused on X-band frequencies, with the aim of supporting those X-band terminals that were already in operation on DSCS, and the expected lead times for WGS and TSAT programs. The Company saw a gap in available capacity until those programs came online, and deployed our two spacecraft specifically to support the Iraq and Afghanistan theaters  because thats where the need was. The XTAR team worked very hard to get their capacity on the right contract vehicles. I was at DRS when DSTS-G finally added X-band to the contract in 2007. The first task order for X-band on that contract was TO 350, awarded to my team at DRS, supported by multiple vendors who together played a crucial part in crafting that winning solution. During my time at CapRock, CapRock Government Solutions identified a need for X-band to serve its government customers. CapRock gained a strong foothold in the marketplace, winning a number of subsequent task orders and gaining a great deal of experience with X-band and the customer base that understood how to leverage the unique advantages of these frequencies. Looking back over the past few years, Im proud to have been at the forefront of the use of X-band (from my time in the British Military) and in the deployment of commercially available X-band. The platforms that I have helped establish will continue to feed the expanding needs of multiple customer sets, to foster growth, and to lay the foundation for continued XTAR expansion. What role do you see for commercially available X-band and how do you see that evolving over the next 1-3 years? I am very bullish about this marketplace, and believe that the Company has a critical role to play in developing the market for commercially available X-band, and for helping users make the most of this valuable mission enabler. I see a natural preference and a compelling reason for using X-band in a large number of cases, compared to almost any other satellite frequency. More and more people are becoming aware of X-bands strengths and advantages as a resource. It is probably more useful to think in longer terms than 1-3 years when talking about the future impact of commercially available X-band. Remember that this is a resource that has only recently become available, and already there is a significant uptake of capacity. Certainly, there are gaps in the global coverage on the commercial side, but typically they can be fulfilled by using WGS capabilities. The Company has expansion plans to help fill those holes, but we are not here to compete with integral military assets. Were here to augment and provide support when those assets cannot meet those requirements. Of course as we plan future expansion, discussions with military planners will be key. XTAR is eager to engage military planners and policy makers in dialogue, both directly and through industry forums such as the Satellite Industry Association. We want to be ready to support the next conflict, wherever and whenever that might be. I think commercially available X-band has an important role to play in this strategic planning. What is the relationship between military users and commercial X-band providers, and how would you like to improve on this to better meet the mission requirements of the user? Providers of commercially available X-band have delivered strong performance to military users in Iraq and Afghanistan. Despite this positive record, users do not have strong awareness of commercially available X-band and its capabilities. We have another obstacle to overcome  the military perception that commercial means C-band or Ku-band only, and that X-band is a military-only asset. 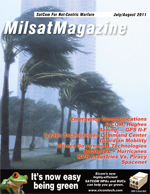 Users do not recognize that industry has several sources for commercially available X-band, all of which bring a unique, commercial and government-oriented capability to the table. The mission of the providers is focused on fulfilling requirements for the U.S. military first and foremost. The bottom line is that we cannot sell a transponder to the next broadcaster that comes along  we dont have that outlet. Understanding and supporting the militarys and governments mission success is key to our future and gives us a very strong connection to the military. We cannot afford to deviate from that. We must enhance this very strong connection, and show the user that we have a vested interest in the success of their missions. Since the DoD continually rotates decision makers in and out of key posts as promotions and Permanent Changes of Station (PCSs) take place, the relationship with X-band providers can be very challenging. The diffusion of knowledge about commercially available X-band is not and cannot be as thorough as we would like. Satellite, although an important mission enabler, is really a fairly small part of the overall military communications picture. This means that we are constantly engaged in an education and reeducation program, to ensure that this valuable mission resource is employed to the fullest extent. Can you explain how XTARs highly responsive and reliable service supports the users with whom you work directly and those who receive service through integrators? XTAR will distinguish itself in the market in various ways. Providing service on a unique part of the frequency spectrum is one way in which we do that. Just as important, is how we support the users mission by understanding where we fit into the value chain and providing a highly efficient service. The Company is working hard to give customers easy access to our space segment. That means working with the government and integrators to establish as many teleports/access points as possible. It also means establishing contracting options which are efficient and flexible. Commercial X-band is very often used to support surge requirements for testing, demos and to support short-notice or short-term operations. For that reason, XTARs objective is to make it as easy as possible for customers to get onto our bandwidth with little delay. We measure our success by the success of those with whom we do business. In the case of those who wrap our services into a broader solution, integrators, that is, we go out of our way to support their business by doing what we do well  operating satellites and providing easy access to quality space segment  and helping them to do what they do well  assembling solutions targeted at specific requirements. In the end, the big winners are the government users who get more for their money and can count on strong support on their way to mission success. Please explain what benefits users have seen from XTARs relationship with HISDESAT of Spain, and what new developments are on the horizon through this partnership? HISDESATs stake in XTAR is an important aspect to the continued growth of the company. They are a source of operational support in that they host and maintain some key TT&C uplink sites. They are also an important reseller of the Companys capacity, and if taken collectively, they are one of our largest customers, growing their use of XTAR capacity significantly every year. This clearly demonstrates that they are fully behind the Company and the business model we have, are committed to our success, and have a wide-reaching capability to bring our capacity to a growing number of customers across the globe. Perhaps most importantly, they see XTAR as a long-term venture. This means both the initial investment, but also the time and effort they put into the continued growth of the Company, working with their customer base to grow capacity sales through a number of channels not directly available to XTAR. They are a strong partner, and fully vested in our continuing growth and success  they truly see our success as their success, and they are consequently great partners to have. XTAR has two satellites which cover a very large and important portion of the globe. Please tell us about your plans to expand that coverage so you can provide service to more users in other regions. Growth is a key factor for XTAR in the future. We have already seen a large spread of the mission support being requested by customers. It is becoming more geographically diverse. Were also being asked to support smaller remote VSATs with higher date rates, on moving platforms on HUMVEEs, on airborne assets and even on fast moving, rigid raider-type assault boats. What this means is we need more capacity, more powerful beams to support the smaller antenna sizes were being asked about, and a greater geographic reach than we have today. Were working with our customers and partners to determine the market opportunity and to develop the business plans that will enable us to pursue the next stage of the Companys growth. This includes additional coverage of SWA, Africa and the Asia-Pacific region. This could mean a new spacecraft, or a hosted payload on someone elses spacecraft. Both are still under consideration. We are also considering whether we remain a wholly X-band provider, or bring military Ka-band frequencies or UHF frequencies into operation. If we do decide to go that route, we must decide in which region(s) we will bring those payloads to bear? Theres a lot to think about as we plan our future, but certainly were bullish about the market, and feel were well positioned for growth. The partnership is fully supportive of our ambitions, and is bringing their considerable influence to the market. All in all, the future looks bright for XTAR, and were optimistic about our prospects.